My family loves all kinds of fresh baked breads and I also make breads at home to get chance to make them healthy. You know, low sugar, no chemicals and above all fresh taste. Who does not love that?! I usually make two batches of Ciabatta Bread Dinner Rolls at weekend and freeze'em..... then enjoy fresh bread WHOLE week. Often, I bake four big rolls or sometimes, I make small eight rolls. This is totally per need, once you perfect the bread dough, you can make any shape or sizes desired. In my home, everyone need reason to devour bread. Other than galloping it in dinner with some hot spicy curry, soup or pasta, we love trying various ways to eat fresh Ciabatta. We turned it into garlic bread, even made ciabatta bread pizza, toasted and topped with cream cheese for breakfast, made croutons and what not!! 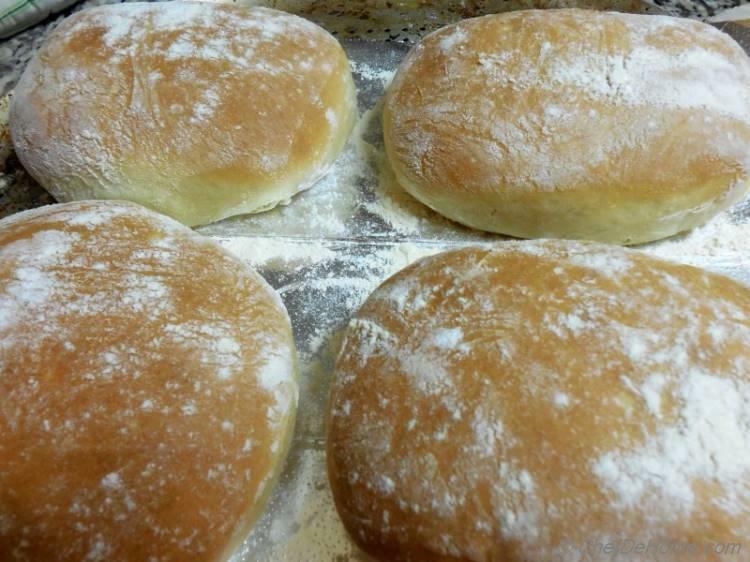 Sweet fragrance of fresh baked bread rolls make you crave for these soft pillow ciabatta rolls even more. For new bakers, Italian or Country-Style breads are best way to start bread baking at home. 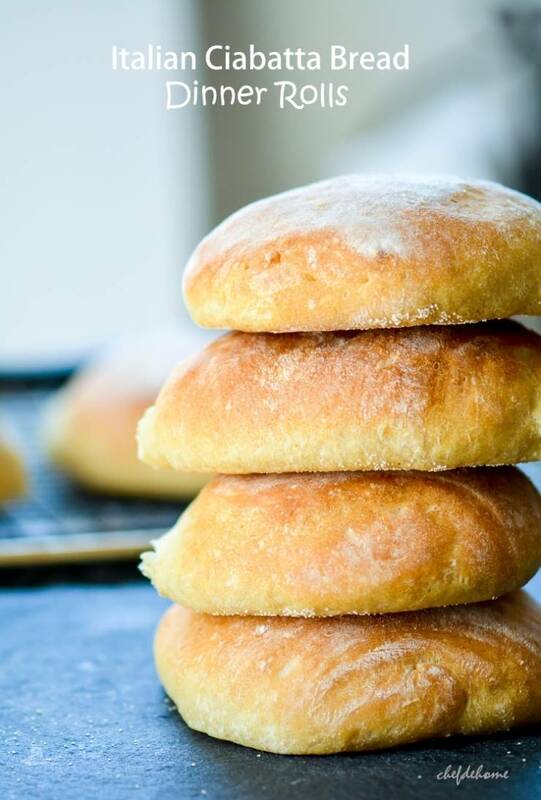 Few important things when making ciabatta rolls - first and foremost kneading, kneading for suggested time enhance the quality and texture of the bread and it is great exercise too ;) Second, is baking time and temperature. Bake ciabatta at specified temperature, for only 22 minutes first and then keep checking every one minute, if bread sounds hollow when tapped at the bottom, DO NOT over-bake it, that turns the bread dry. 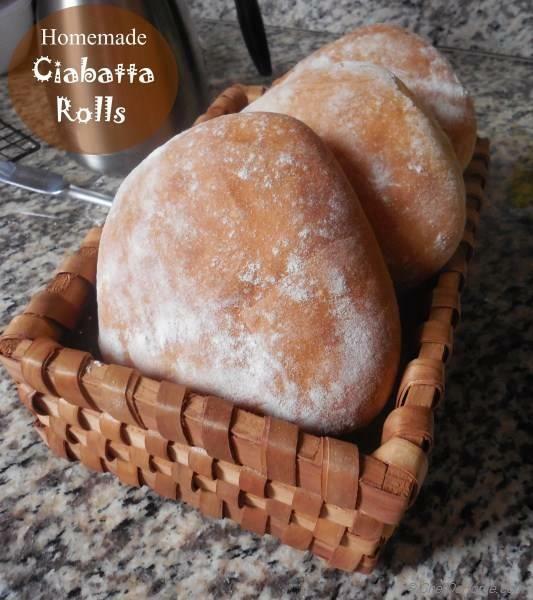 Make ahead Ciabatta Rolls for Christmas dinner and I tell you, you will thank me for this excellent recipe. 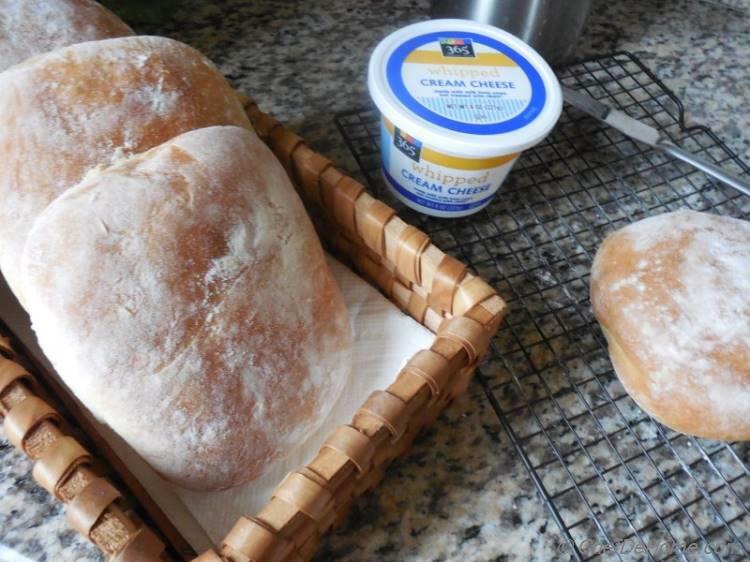 Here are few of my other favorite ways to eat fresh Ciabatta!! Total Time 45 minutes Prep Time 20 minutes Cook Time 25 minutes Difficulty Intermediate Yields 4-8 Ciabatta Rolls Serves 4 Notes Idle Time to bread rising and fermentation - 7 hrs. Smart Swap Use part whole and part all-purpose for a more crusty bread! 3. Shape the Dough - Punch the dough, transfer to a floured surface. 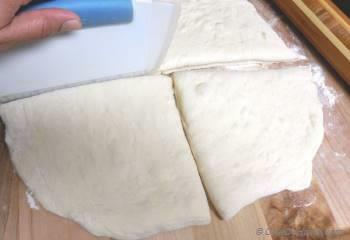 Gently roll the dough to make a 12 inch rectangle. Divide it in four portions. 4. 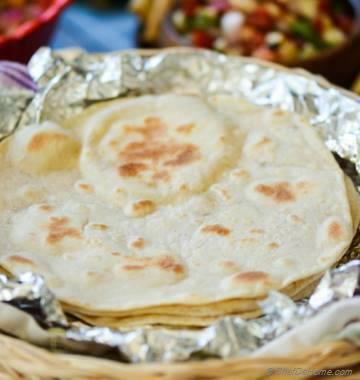 Shape the Dough - Sprinkle a baking sheet with 2 tbsp of all-purpose or semolina flour. Shape each half into a small rectangle by folding it like letter (tucking the edges inside). Transfer each folded rectangle to baking sheet, folded ends facing down and place'em in 2 lines, 3-4 inch apart. 5. Bake - Preheat oven at 425 Fahrenheit. 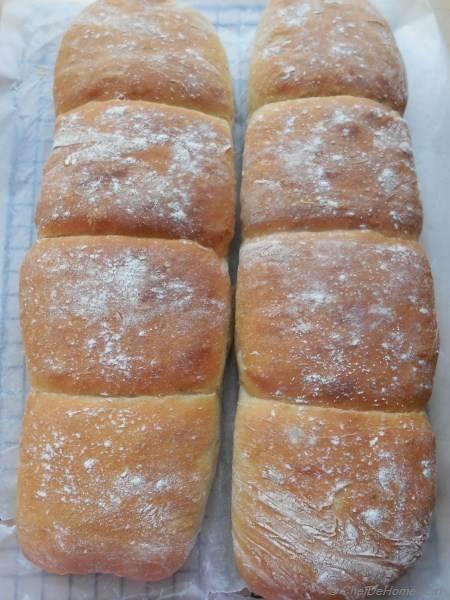 Cover with kitchen towel and let rise at room temperature for 60 minutes (or until almost doubles in size) , then bake for 22-25 minutes or until tops are brown and bottom of rolls sound hollow when taped. 6. Transfer to a cooling rack. 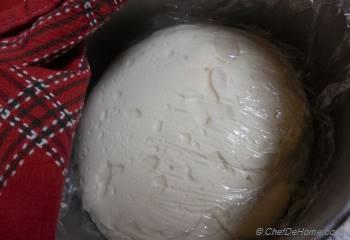 Serve warm or let the bread cool completely, then wrap in plastic wrap and freeze for later. To defrost, I microwave frozen bread for 2 minutes at low power. Idle Time to bread rising and fermentation - 7 hrs. Start by mixing and leaving starter to ferment at night and eat fresh bread by lunch. I am cu making these but I am using bread flour because I have a bunch of it. The starter doubled way faster than 4 hours but the type of flour is probably the reason. My question is.... Is the dough supposed to be very sticky? Dough should not be very sticky. 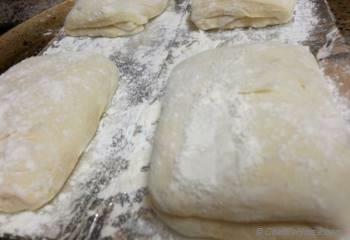 Sticky dough will not let ciabatta hold shape when baking. Bread flour is fine than AP flour and may need less water. Best way is to add more flour - 1 tbsp at time until dough is soft but not sticky or dry. Thanks for the reply, Savita. I love baking, but am always challenged when it comes to that final step of rolling out doughs into the proper shape with a consistent thickness. My rolls came out fine (I folded them into 3rds), but no two look anything alike! 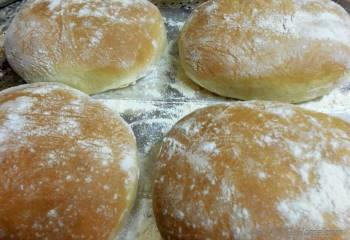 I also made a batch of Lion House rolls today with the same result. But they all taste fine! Hi Bill, in my humble opinion, that's the joy of home cooking, it is suppose to be rustic and not same always. Isn't it? 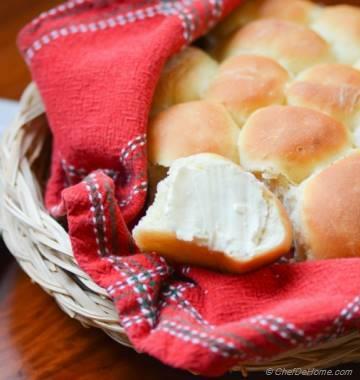 On a side note, when I want to make sure all rolls are same size.. say for blog pictures or serving guests.. For round dinner rolls - I use a weight machine or flour dusted small bowl to weigh/shape same size of rolls. For relatively flat rolls like ciabatta, I use a scale to cut equal length pieces of rolled dough, then fold those. This does take some time, but results in neat rolls. I hope it helps. Hi, Savita! Thank you for putting up this recipe. 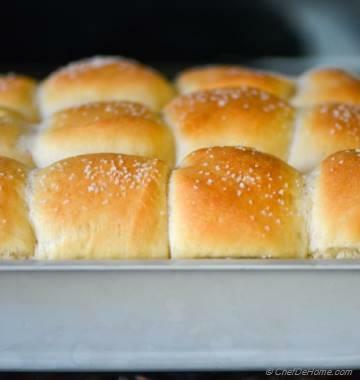 I JUST threw my first batch in the oven and I have a question regarding how to form the rolls. Your recipe says to 'fold like a letter.' When I fold a letter, I fold it into thirds so that it fits in an envelope. Is this what you mean, or do you mean to only fold it in half? Other recipes have different shaping instructions. Thanks. Hi Bill, I'm glad you using this recipe. I meant folding into thirds not half. This is how I fold it mostly. It all depends on kind of rolls I need. I think, three folds make fluffy rolls. I'm not sure about other recipes though. I hope it helps. Thank you so much for this recipe.I love to bake in my convection oven in our RV bus. I have always wanted to make these and I followed your recipe to a T and they turned out beautiful and delicious...Thanks again! Just found your lovely site,would it be possible to have the cup measurements in grams too please for the flour and the water. Thanking you so very much. Hi Patricia, I only use cups measurements for this recipe. So unfortunately I don't have ingredients in grams. Can sourdough starter be substituted for the starter in this recipe and if so what is the exchange? Sharon, sour dough starter should work just fine even though I have never used it for this recipe. 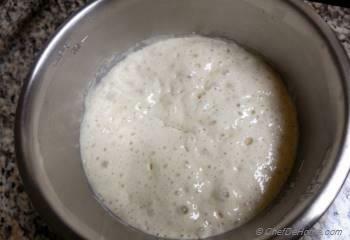 I suggest using the 1/2 amount of fresh starter and adjust the rest with flour/water while kneading (as needed). I hope it helps. 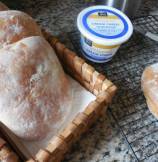 This is one of the first bread recipes that I have ever made....so easy! I add 2 t of onion powder for a variation of flavor. Makes excellent hamburger buns too! Janet, thanks for such wonderful feedback. 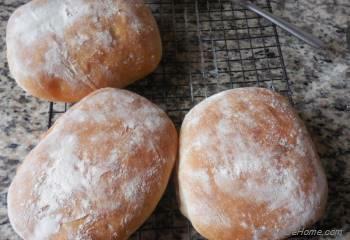 Actually, these ciabatta rolls are one of my favorite out of all my baked breads. I'm glad you enjoyed it. Wonderful Bread!!! Made it exactly to a T of how the directions were posted! Never realized how long a process it would be but sooooo worth it! Shannon, thanks. I'm glad you liked final product. Yes, it does involve starting a day ahead, but quality of bread is very good. Enjoy! Hey Mary, I'm sure you will love making this bread. If you follow all steps as-is, I bet you will be amazed at the quality of this Ciabatta! I do have, not one, but 4 foccacia recipes for you! Check out in Breads sections. I will have to try making these. I have only recently begun experimenting with new breads. I need to check to see if you have a foccacia recipe as well, as the one I tied was not to my taste. Hi Savita Well well well. I have just finished making your Ciabatta recipe. I cannot send you a photo because they are all gone. I thought I had 8 pieces there not any longer. My son and husband devoured them while I was eating one in the office. thanks @Ari, it was indeed an excellent bake! hi, I found this picture on google+. good clicks and steps making it look so easy. I have to try this one. this bread is asking me to bake this weekend.. excellent bake Savita!